bluh » Rest in peace, Mingus. Saturday was hard. 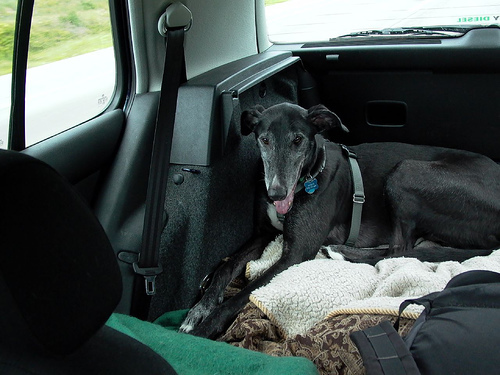 We made the decision to euthanize one of our greyhounds, Mingus. He had been acting a bit out of sorts for a week or so but the noticeable weight loss and not eating really got our attention. I took him to the vet Saturday morning, expecting some costly diagnostics and overpriced medicine, then to bring him home and a few days later have him back to his normal, happy self. But the prognosis was not good – quite bad, in fact. Infected fluid and blood was filling his abdomen. He would either need to be hospitalized over the weekend with intravenous fluids and antibiotics or sent up to a distant animal hospital for an ultrasound and surgery. Even with option #2, the doctor gave him a 50% chance at best, assuming they were able to diagnose correctly from the ultrasound. Waiting and seeing would just put him through more misery and the surgical option even moreso, not to mention his odds of survival were slim. He’d just been to the vet in December and everything was stellar – his blood work, temprement and vitals were all exemplary. Then one day he just stopped being as active, as happy. One day he’d be better and the next day worse. The vet told us there was nothing that could be done, that even if it was detected earlier, It was clear how much of this he was hiding from us, how much pain he was going through. The vet also told me it was terribly difficult to do, but it was the right decision. I petted him as he slowly drifted away, finally getting relief from the pain. 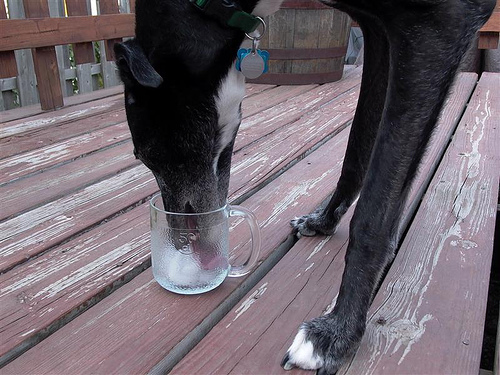 Mingus came to us through USA Defenders of Greyhounds group from the track in Fort Lauderdale, Florida where he raced as Mc Ten Yard Pin. He had an awful kennel name – Gangy – and having just re-read “Beneath the Underdog”, I thought Mingus a fitting name at the adoption. He was funny, quiet, loving and very relaxed, spending most of his time laying around on his bed, the couch, our bed or any other comfy flat surface he could find just as you’d expect a retired racer to do. I’ve never met a dog so large and polite – he wouldn’t step over an extension cord laying on the floor unless you told him it was OK, but he would hop up on the couch and curl up right next to you without a second thought. One minute you’d think he was the meekest dog on the planet, the next he’d be trying to climb into your lap or casually tasting your drink on the coffee table. We took him on thousands of miles of road trips, many of those rolled by with his head stuck out the car window, slowly painting the side of the car with slobber. He was the first dog we could call our own. And we miss him terribly. Oh no! 🙁 Goodbye Mingus! Between the name and the reference, I’d say you’re definitely the Robyn I knew from back in the day. Good to hear from you – while I’d hardly say the days at BHS were good, most of the time outside that place was great. I’ll be in touch. And thank you for your condolences.